Vacationing for the last two weeks has no doubt impacted my cooking repertoire, and has at the same time made me want to eat healthy again. Wanting to make this interesting take on hummus by way of my Healthy Eating Pinterest board, I decided to make it last night along with my vegetarian dinner of grilled eggplant with peanut and lime sauce. The method of making this hummus isn't much different than it sounds, adding an avocado at the last minute of preparation. To add a little more creaminess and tang, I also substituted the tahini with a zesty Mexican sour cream, which worked well. I'd imagine that Greek yogurt would work nicely too. A little hint about the avocado is that it must be ripe and a little softer than what you'd use for guacamole. An overripe (slightly browning) avocado would be just the thing to use here. Enjoy it with some chips or a soft pita wedge. 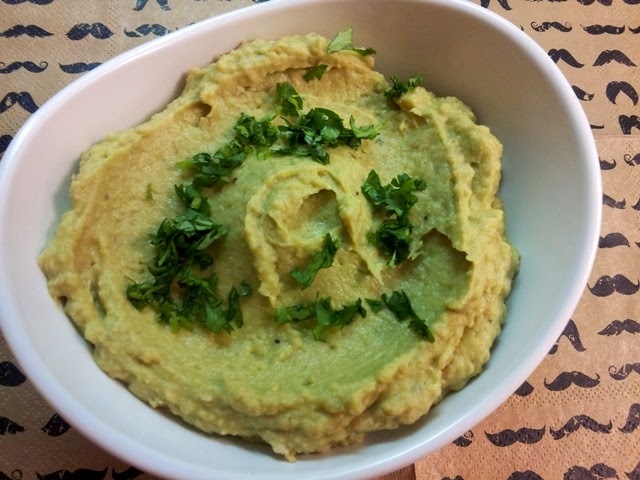 Avocado Hummus recipe by way of Cooking Classy blog.